During my last restaurant outing, I was in Bucktown enjoying some French food. Next to the French restaurant is a Japanese restaurant named Izakaya Mita at 1960 N. Damen Avenue. Looking in from the outside, there was an intimate feeling about the restaurant that I thought would make it ideal for checking out, that being there would be no extreme crowds. Well, leave it up to me to go on a Friday night and experience a crowd. Anyone who has gone will agree that there is a good reason for the congestion. On the evening that I went, I had come off of a ridiculously nerve-grating day at work. The best way I figured I could null the desire to scream at the top of my lungs was to imbibe a flight of sake. 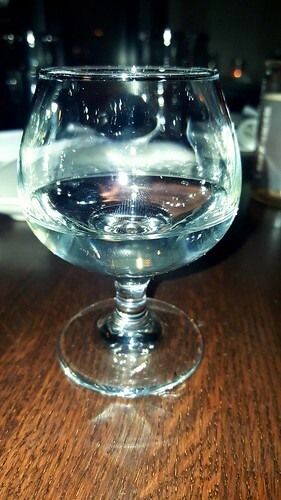 My server was grandtastic — new word of the day — coming up with recommendations and explaining where they were produced, the ingredients in the liquid recipe, what made them spectacular, and pairing them with the dishes I ordered. 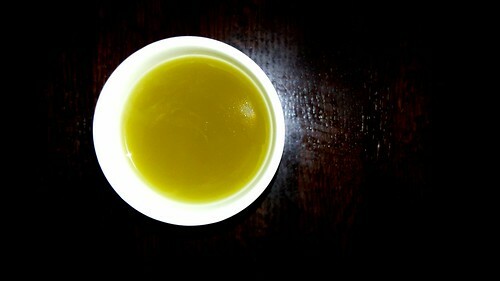 For example, I had a refreshing sake that went very well with a small bowl of spicy seaweed. There was an inquiry of whether I would like to sample some raw seafood. This gave me the indication that sashimi was perhaps on the offering. It was. I had some meaty tuna sashimi with another glass of sake. For those who may want to indulge this full coloured, mouth-watering lovely should note that it is a small plate with four succulent slices of resh tuna. It is still a splendid order as a small plate. 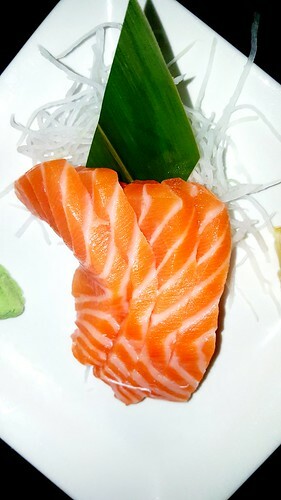 The same can be said of the salmon, which I had with my third sake option. Salmon is one dish that I never tire of eating. When it is cooked such that it is tender and flaky, complaining is never an option. Having it sashimi style has now gotten me addicted to enjoying it before being seared by a flame. There was nothing stringy, fishy, tough, or chewy about the salmon. If it had come on a larger plate as a larger portion, I would have been even happier than I was with it as a small plate option. By the time I was finishing the salmon sashimi, my sister had arrived. That meant more food. It did not mean more sake. While she ordered some dishes and cocktails, the latter to take her mind off having had a mad week at work, I ordered some mushrooms for sharing. 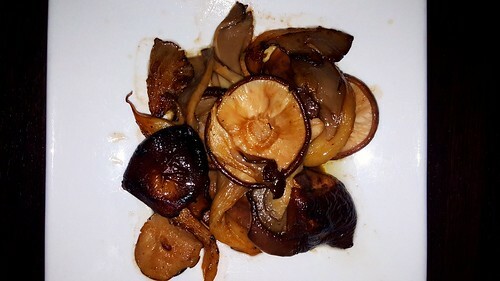 Grilled to tenderness and accented with a light sauce, we devoured these fresh mushrooms and noticed that they had the flavour of the garden variety that had not been rushed in growing. There was a reminiscent moment of when we had tasted mushrooms at a favourite sushi and robata grill restaurant named Yuzu in Chicago’s West Town neighbourhood. Another shared dish was beef tenderloin over small salad. Neither one of us is a fan of rare or medium rare meat. Imagine both of our surprises when we had gobbled these rare morsels to completion. There were no overpowering herbs and spices in the recipe, so there was enough taste in whatever marinade the chef used to prepare the meat. Nothing was overcompensated and that may have been why it was easier for us to navigate the raw meat without thinking much about it, until we had gone around the plate sopping up the last bit of juice with the lettuce. We sat and caught up with other about the week for several minutes before ordering light sweets and green tea. My sister had green tea cheesecake while I had three green tea mochi balls. 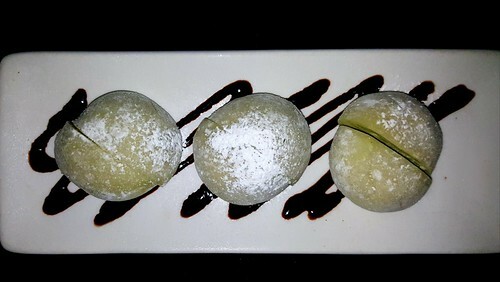 Not only are mochi balls a swell palate cleanser, but they are also light on the stomach after a hearty meal. 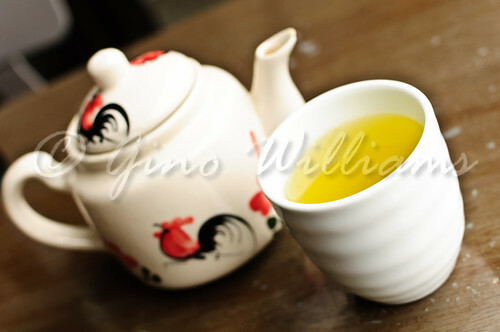 The green tea was definitely good for digestion after all we had eaten. This was loose leaf green tea, too, so I was thoroughly content. Izakaya Mita is not a large sushi bar, but it is most definitely a fan favourite for a lot of individuals. It may be that the Wednesday I went to the French restaurant was indicative of a lighter night. Fridays may be the beginning day of the weekend when everyone wants to enjoy fun, excitement, fellowship, and good food way from home. With this being my first visit, the one server who gave us recommendations was the only indication I have for superb service. I don’t have to be redundant and say ad nauseam that the food is worthy. What I will say is that one may find plenty pretentious Japanese sushi, yakitori, and robata restaurants in the metropolitan Chicago area. Izakaya Mita doesn’t pretend. They’re just damn good. Recently I received an email about a Japanese sushi and robata grill in the Noble Square neighbourhood in Chicago. I can’t tell you how many solicitations arrive in my inbox from advertising agencies and marketing houses wanting to provide photos and written copy for me to post on Chicago Alphabet Soup. Bad enough I don’t think WordPress allows advertising — as that could mean me making money off of a free site, which would probably go over like a lead balloon. But when I got the email about the Japanese restaurant, I knew that the person who sent it apparently follows Chicago Alphabet Soup enough to know that the blog site is a showcase of my photography and experiences at restaurants and that I only feature ethnic restaurants — albeit some American restaurants are on the site because they are worthy of their inclusion of ethnic influences. 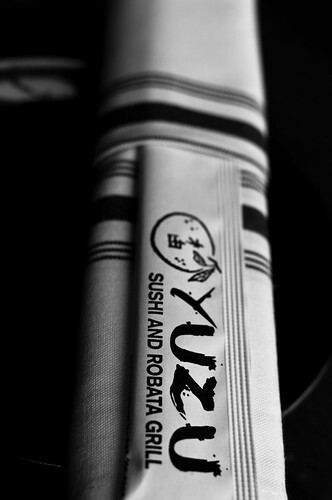 Yuzu Sushi and Robata Grill at 1715 W. Chicago Avenue was the subject restaurant. Although it is on a stretch of Chicago Avenue that has pedestrian traffic, it is not in a high foot traffic area. Nevertheless, it has more of the hipster allure to it, which is pretty much gobbling up the landscape of Chicago. It is more reflective of a younger crowd and truth be told, the hipster cabal tends to be representative of diverse thought and that also carries over into the acceptance of different cuisines. Well, it was easy for me to fit in to the scene and noting the constant ebb and tide of customers through the restaurant, it was apparent that they are doing great business. I knew that I was going to be overzealous with my dining options, so I ordered hot green tea to ease digestion of the numerous culinary options I had planned to have. Then I began the dangerous task of wanting more than I knew I should have had. Starting small, or so I thought, I ordered a tuna poke. This was Hawaiian tuna salad with green and white onion, Japanese chilli pepper, soy sauce, and sesame oil, served atop avocado with an avocado fan for the backdrop. 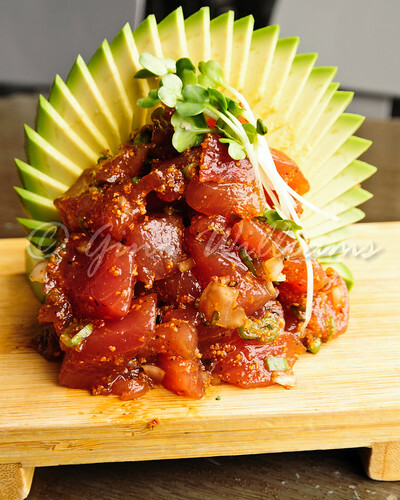 For those who claim to be adventurous with their dining, and you know you say you’re open to trying new things more or less to impress someone, the tuna is raw. Since I love my fair share of sushi, it was no problem for me working my chopsticks on the tuna poke until it was all gone. 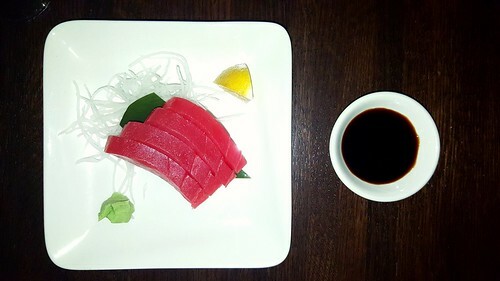 I must say that the soft texture of the raw tuna and the creamy texture of the avocado may be a bit much for some people, so beware if you are daring. Next to come to the table was a flight of the robata grill. These items were prepared yakitori style, being that they were skewered on sticks the way they are prepared for street food in Japan. There was soft shell shrimp with a yuzu sauce. Again, this may be a bit daring for some people’s palates because you get the whole shrimp from head to tail. Next was chicken brushed with black bean sauce and topped with green onions. Looking at it, one may think that it is bland. The flavours burst with each bite to the point where it was anything but pedestrian. Per the server’s recommendation, I had nasu, which was Japanese eggplant with teriyaki sauce. Eggplant parmesan what? Baigan bharta what? Give me tender Japanese eggplant on a stick from now on. Another item on the platter that was slightly different but well worth ordering was shishto. 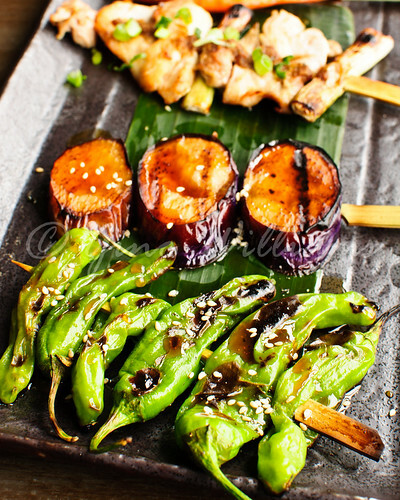 Who would have thought that Japanese sweet peppers with ponzu and teriyaki sauce would have such a winning flavour? Imagine my surprise when I exclaimed, “Wow’” after the first bite. 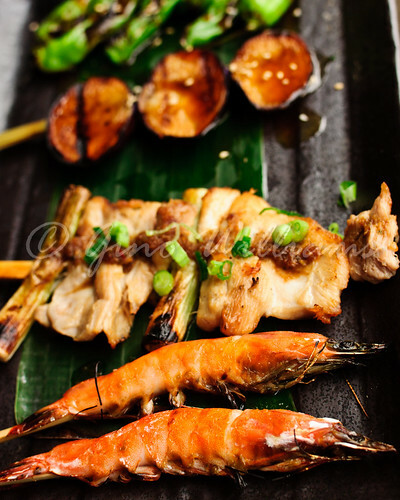 Spicy but not peppery, this yakitori item is a favourite now. After some time to relax and let the previous servings settle, I was ready for more. I ordered a whole grilled squid. Topped with ginger and garlic and served with jalapeño dipping sauce, I immediately swore off having fried calamari and fried squid ever again. I had made that statement before. However, it was an absolute declaration this time. 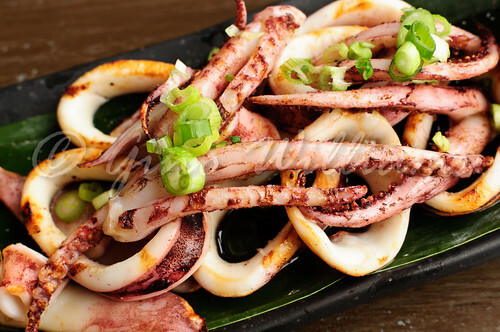 There was no rubbery texture to the squid and that is one of the things about squid that most think is bothersome. That was not the case with the whole grilled squid at Yuzu Sushi and Robata Grill. 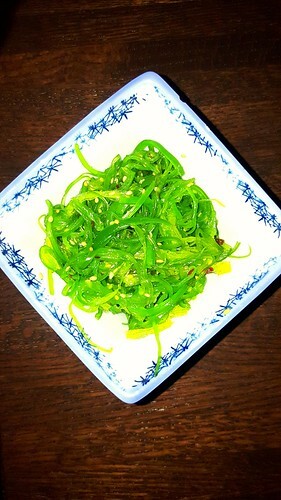 And having squeezed lemon over the squid and used the jalapeño dipping sauce, I accepted the fact that I had a winning lunch and was even happier that I had followed the advice of the email note I had received and gone to the restaurant. But that was not the end of it. The server had asked me if I wanted to try any sushi. Thinking that I would have been too full up to this point, I was hesitant. Drinking the hot tea really did wonders for not leaving me feeling stuffed. So, I told my server what I liked and she recommended a maki roll that they call Sorry, I’m Drunk. That was a rather curious name for a sushi roll. And even after it came to the table, I still could not believe the name. Unagi, cooked shrimp, spicy mayonnaise, black and red tobiko, chilli oil, and scallions comprised a magnificent display on a wooden board. It looked like a flower, with the sauce and the arrangement. There was such a wow factor to each bite. Freshness to each piece was a testament to the quality of the ingredients. Even the unagi sauce was not sweet, which means you can taste the unagi, shrimp, and spicy mayo. It was incredible. Well, there was no way I was going to leave without having tried a dessert. I figured I could not go wrong with something light. Mochi balls were it. The flavours were mango, green tea, and strawberry, each placed on a plate and accented with sauces that gave the presentation of a flower and buds. 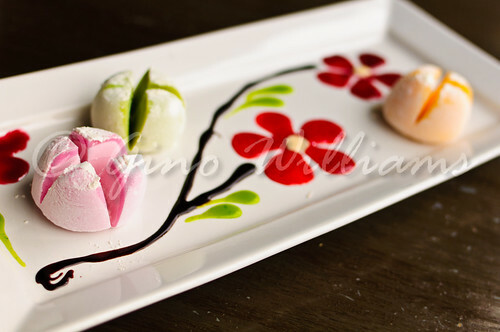 You can’t go wrong with mochi balls and whether they are prepared in-house or somewhere else, they have such a bloom of flavour that you cannot fight when the option to sample some is presented to you. This was an absolute wonderful ending to a fantastic meal. 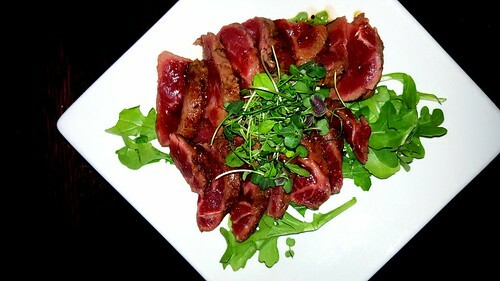 The quality of food at Yuzu Sushi and Robata Grill is comparable to or better than any high-end restaurant in Chicago. Where Yuzu comes out ahead of the game is with reasonable prices. 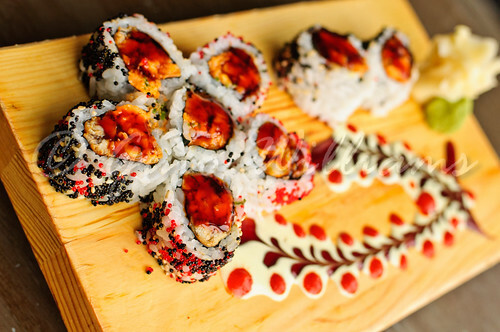 Much like the low cost for street food, you get some really great sushi, robata grill items, and other greats without feeling as though you have given a down-payment on an apartment. Another positive note is the outstanding service. I am a huge advocate of going to restaurants where the wait staff is extremely helpful and even conversational. It makes the experience that more enjoyable. There is only one other robata grill in Chicago where I have had enjoyed my visits thoroughly and now Yuzu Sushi and Robata Grill is its competition. A return visit is necessary.